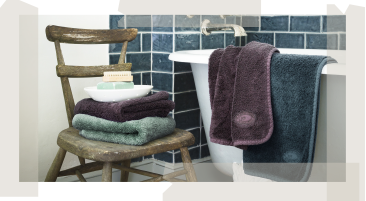 Using our extensive knowledge of how to care and prolong the life of bed linen and towels spanning over 165 years, we’ve put together a guide to ensure that you get the most out of your Christy bed linen and towels. While we may have advised that you use a mangle in the past, today a washing machine and dryer will suffice. We've put care and attention into creating the washing instructions on the label of the towel/bed linen. By adhering to recommended washing instructions you will guarantee enjoyment of your Christy products for years to come. Ensure that you use the recommended amount of washing detergent. Take care not to expose your towels/bed linen to neat detergent prior to washing, as this can promote colour fading. Select a gentle laundry detergent. Many modern detergents contain bleach or whitening agents. Ideally, these should not be used when washing coloured towels/bed linen as they may progressively fade the colour. 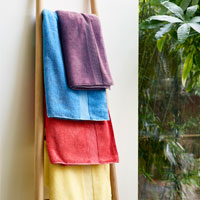 Using a detergent designed for colours will ensure your towels/bed linen retain their colour for many years. For best results tumble dry your towels/bed linen on a gentle heat. This will give your towels the softest finish and help reduce creasing on your bed linen. Do not dry your bed linen for longer than necessary. When the wash cycle has finished remove bed linen promptly from the machine and shake out whilst damp to minimise creasing and drying time. Iron your bed linen whilst still slightly damp: it’s easier! 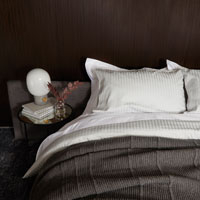 In the event that bed linen has been over dried, use a water spray to dampen fabric before ironing. Limit the use of fabric conditioner on your towels. Whilst they give your towels a soft feel, overuse of conditioner leaves a coating on the towels and reduces the absorbency. Pulled threads occur when loops catch on sharp objects. Christy towels are woven meaning that threads won’t run, so if you encounter a loose thread, simply cut it off. To prevent pulled threads avoid washing towels with other garments, which have hooks or zips. Bleach will remove the colour from your Christy towels/bed linen permanently. Avoid contact with surface or bathroom cleaners. Some facial cleansers and skin treatments contain Benzoyl Peroxide, which has the same effect as bleach. Check the label for this ingredient, and rinse hands and face thoroughly after using these products as the effect on your towels/bed linen may not be apparent until after washing. 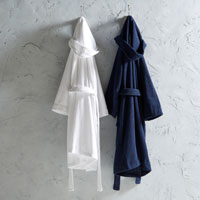 Separate light and dark coloured towels/bed linen, as you would with other items. With darker and brighter colours you may find that some excess dyes wash out during the first few washes. This indicates that your towels or bed linen can be machine washed. The number represents the temperature that Christy recommend to achieve best results. This symbol indicates that bleach should not be used when laundering the product, not even on white towels or bed linen. The chemicals in bleach seriously damage fabric. This indicates whether or not you can dry clean an item. Christy do not recommend dry cleaning their towels or bed linen. However, some of our accessories such as throws and cushions may need dry cleaning. This indicates the temperature for recommending tumble drying your Christy towels or bed linen. The number of dots represents the level or heat. Christy recommend that you use a gentle heat setting. Have we answered your question? If not, get in touch with our customer services department and we’ll have an expert get back to you.